In 12-inch nonstick skillet, heat oil over medium-high heat. Add chicken and gingerroot; cook and stir 4 to 5 minutes or until chicken begins to brown. Add broccoli, 1/2 cup of the broth and the pepper flakes. Cover; cook over medium heat 2 minutes, stirring once. Add peas; cook 2 to 4 minutes longer, stirring once, until vegetables are crisp-tender. In small bowl, mix remaining 1/2 cup broth, the soy sauce, vinegar, cornstarch and sugar; stir into chicken mixture. Add onions; cook, stirring frequently, until sauce is thickened and bubbly. Serve over rice; sprinkle with cashews. If you choose to cook regular brown rice, be sure to start it before you begin stir-frying—it will take about 45 minutes to cook. The instant type takes only about 10 minutes. Frozen broccoli can be substituted for the fresh. 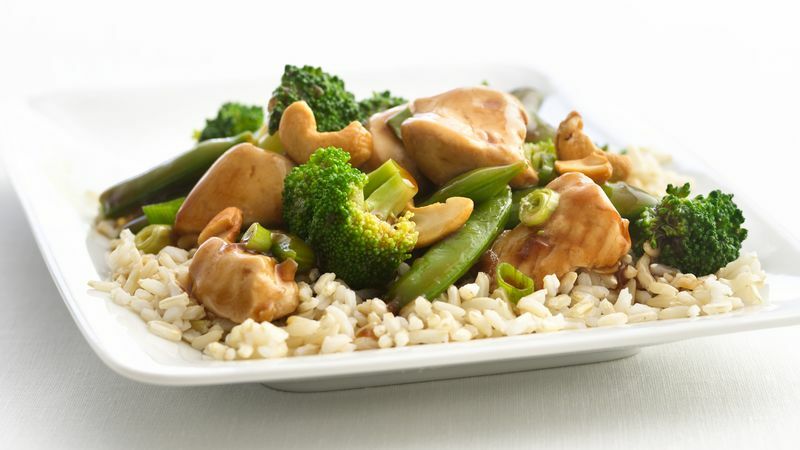 Look for packages of pre-cut chicken for stir-fry in the meat department.